X-23 (Laura Kinney also known as Laura X) is a fictional character from the X-Men: Evolution animated series. X-23 (stands for Experiment #23) is a clone of Wolverine. X-23 first appeared in episode number 41 (titled "X-23"), where she was voiced by Brittney Irvin. In the final episode of Season Four, what appears to be an adult X-23 is briefly shown as a future member of the X-Men. X-23 appeared in the Marvel Comics Series NYX in 2004. The character, much like the character Harley Quinn of DC Comics or Marvel's own Firestar, originally was created for an animated series, then brought into the comics. X-23 was created by Craig Kyle. He and Chris Yost wrote the two episodes of X-Men: Evolution that X-23 appeared in ("X-23" and "Target X") as well as the comic book miniseries that details X-23's origin. X-23 also appears as a boss in the GBA version of X-Men: The Official Game. Wolverine discovered through S.H.I.E.L.D. that Dr. Deborah Risman, working for Hydra, had created a female clone of him. The clone possessed two retractable claws in each hand (instead of three like Wolverine) and one similarly retractable claw in each foot (something Wolverine lacks). The clone was identified only by the codename X-23 - the first success after 22 failures. Denied the life of a normal child, X-23 was lonely. She had almost no companions and had been under observation her entire life. She had to spend most of her time training to hone her skills. Angry, X-23 decided to get revenge on Wolverine. She invaded the X-Men's mansion looking for him, and when she ran into the other X-Men, she was able to defeat them through stealth with little trouble. When Wolverine confronted her he felt sorry for the girl, so instead of turning her over to S.H.I.E.L.D. like Nick Fury wanted, he let her go. Later, Wolverine would encounter her again, finding her on the run from Hydra's agents as well as S.H.I.E.L.D. She allowed herself and Wolverine to be captured, with the intention of using this as a way into Hydra's mobile HQ. She succeeded in destroying the craft, faking her own death in the process. A young X-23. Cover to X-23 #2, by Billy Tan.When a top-secret program attempted to recreate the original Weapon X experiment that produced the feral mutant Wolverine, they failed to secure a test subject that could survive the bonding of the virtually unbreakable metal Adamantium to their skeleton. Seeking to take the project in a new direction, the project's director, Doctor Martin Sutter, recruited renowned mutant geneticist Doctor Sarah Kinney and tasked her with creating a clone. Using the only available genetic sample from Weapon X, which was damaged, they were unable to salvage the Y chromosome after 22 attempts. Kinney then proposed they create a female clone, and although her request was denied, she surreptitiously went ahead and produced a viable female embryo. Her success prompted Sutter to reconsider. Sutter's protÃ©gÃ© Doctor Zander Rice, whom he had raised after Rice's father was killed by Wolverine at the original Weapon X Project, opposed bringing the embryo to term. When Sutter finally allowed Kinney to proceed, Rice exacted revenge for her insubordination by forcing Kinney to act as the surrogate mother for the clone. For nine months Sarah's every move was monitored. Finally she gave birth to "X-23." Raised in captivity, X-23 was trained to be a weapon. She lived in prison-like conditions, held in a bare white room with no decoration or furniture. Her showers came at the end of a cold fire hose, usually administered by Rice. She was subjected to numerous horrible abuses and a lack of stimulation for anything other than fighting. Kinney did her best to ensure the child retained some semblance of humanity, but her efforts appeared to be in vain. X-23 rarely spoke, or expressed much interest in her mother, who was forced to reject any emotional advance the girl might make, such as laying her head in her mother's lap. After seven years, Rice had X-23 subjected to radiation poisoning in order to activate her mutant gene. He brutally extracted her claws, coated them with adamantium, and re-inserted them into her body. Next, Rice created a chemical compound he called "trigger scent." Upon smelling it, X-23 was driven into a berserker rage. The test of this came when they put the trigger scent on a sword, which forced X-23 to kill her kindly teacher, who had been one of the few people to treat her like a human being. It is revealed that X-23 was subjected to exercises in which she reproduced Wolverine's moves, fighting multiple enemies in perfect sync with a hologram of him from his days in the Weapon X project. She was trained by a woman named Kimura, a mutant who X-23 was unable to harm. She outperformed Wolverine at this test, and it was decided that she was ready for her first assassination. She was 11 years old. X-23 was sent to kill Presidential candidate Greg Johnson. Numerous other missions followed, as X-23's services were sold to the highest bidder. Rice, in an attempt to avenge his father's murder, abandoned X-23 on a particularly dangerous mission, but she survived against overwhelming odds and managed to make her way back to the facility. Cover to Uncanny X-Men #451, featuring X-23 and Wolverine. 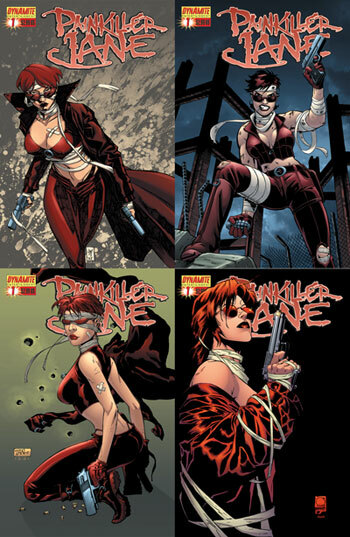 Art by Alan Davis.In the end, Kinney proved herself little better than the others. When her sister Debbie's daughter Megan was abducted by a serial killer, Sarah took X-23 from the facility (without permission) to rescue her niece. She lead her to Debbie's house, where X-23 climbed the wall to Megan's room and picked up the abductor's scent. She tracked them back to the killer's apartment, posed as a girl Scout, and killed the captor and saved Megan. Sarah injected her niece with a sedative, promising she wouldn't remember anything when she woke up. Upon returning to the project, Sarah was fired by Sutter, and ordered to leave the facility. When Rice assigned X-23 to eliminate Sutter and his family, X-23's humanity showed for the first time: she killed Sutter and his wife without hesitation, but she spared their son Henry (who was actually Rice's son from an extra-marital affair). Satisfied, Rice spirited her back to the facility, ordering her not to breathe a word of her mission. However, X-23 ultimately revealed to Sarah that Rice was responsible for the murders. As a parting shot, Rice revealed to Sarah a chamber containing dozens of incubation pods: X-24 through X-50. Sarah prepared to leave the facility, and drafted a letter to her daughter. Before fleeing the facility with X-23, Kinney tasked her with one final mission; destroy the pods and kill Rice. She succeeded, killing everything that stood in her way. However, Rice exposed Kinney to the trigger scent, allowing him to exact revenge on her from beyond the grave. The scent drove X-23 into a murderous frenzy that resulted in the death of her mother. As she lay dying, Kinney named X-23 Laura, and gave her the letter she had written, (as well as pictures of Xavier, Wolverine, and the Institute for Gifted Youngsters). It is then revealed that X-23 went to San Francisco, tracking down Megan and Debbie. She introduced herself as Sarah's daughter, and moved in with them. Megan was experiencing nightmares about her abduction; her family believed these to be utter fantasies. X-23 told Megan the truth about the man she was having nightmares about - that he was real, and she had killed him. X-23 surfaced in New York City and was taken in by a pimp named Zebra Daddy; she worked as a prostitute who specialized in cutting masochistic patrons. X-23 continued to cut herself with her own claws, was mostly mute, and proved unable to free herself from the grip of Zebra Daddy. Upon meeting Kiden Nixon, a young mutant with the ability to freeze time when in danger, X-23 started to come to her senses. Although she ran away from Zebra Daddy, he tracked her down. With the aid of her newfound friends (and the mutant named Felon), Zebra Daddy and his thugs were defeated. X-23 killed him to save the lives of her friends. X-23 later took a job at the mutant-themed Wannabee's nightclub in the Mutant Town district of New York. It was there that she saved the life of the daughter of mob boss Don Parisi from a gang of thugs, whom she killed. The deaths inadvertently implicated Wolverine, prompting his teammates in the X-Men to investigate. X-23 instinctively attacked Wolverine on sight, but he was eventually able to calm her down, and she led the X-Men to Parisi's daughter. After aiding the X-Men against Parisi's super-strong mutant enforcer Geech, X-23 fled the scene. She later returned to help the X-Men save victims of a car accident, after which she was enrolled at the X-Men's Xavier Institute. X-23 as Captain UniverseX-23 quickly became very protective of Wolverine, observing him on the mansion's security monitors and even attacking his teammate Bishop after he felled Wolverine during a training session. During one of her sessions at the mansion's monitors, an anomalous energy Spike prompted X-23 to investigate. She encountered Spider-Man at the source of the signal, mistaking for an enemy and attacking him. The pair ultimately teamed up to save the young mutant Paul Patterson from an alternate reality version of the armored Avenger Iron Man. The arrival of the heroic Captain America and the super-spy Black Widow helped turn the tide. X-23 then secretly followed Wolverine on his investigation of strange activity in the Canadian Rockies. Ambushed by the Hauk'ka, evolved Saurians from the Savage Land, X-23 managed to escape and alert the X-Men. Traveling to the Savage Land, X-23 and the X-Men teamed with the Savage Land's lord Ka-Zar and his circumstantial allies, the Savage Land Mutates, to prevent the Hauk'ka from destroying human civilization by controlling the weather-manipulating X-Man Storm. Sometime later, X-23 was empowered by the cosmic Uni-Power to become Captain Universe. She quickly learned that A.I.M. was hunting the Uni-Power in hopes of using it against their enemies. She agrees to help the Uni-Power and travels with the S.H.I.E.L.D. Agent called The Scorpion to a secret A.I.M. Hideout. There they discover a mass amount of information on the Uni-Power being transferred to another facility. The Scorpion attempts to copy the information but is stopped by X-23. The Scorpion is ordered to take her in but covers for her instead and allows her to escape. Later on The Uni-Power bids his farewell to X-23 and parts ways with her. 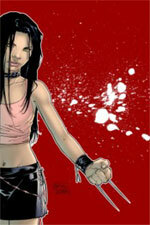 After the events of House of M, X-23 was one of the few students who retained their Powers. The depowered students and staff were sent home; however their bus was bombed by anti-mutant religious zealot Reverend William Stryker. Subsequently, Emma Frost had the surviving students engage in a free-for-all brawl, with those deemed to be the best performers assigned to a new team of trainee X-Men. Despite Frost's attempts to omit her, X-23 was among those students who made the grade. Shortly afterwards, following Stryker's attack on the depowered students, X-23 heard Dust talking to Icarus, who had fled the Mansion. Dust intended to meet Jay, but Laura told her it was a trap. She eventually had to knock out her roommate to keep her safe. Donning Dust's burqa X-23 came to Stryker's compound and was shot. After a few minutes spent healing and playing possum, Laura returned to the Mansion to help fend off Stryker and his Goon'>Goons. The kids grew to be more receptive of Laura following her part in stopping Stryker's attack, in which she single-handedly killed three Purifiers who had incapacitated Surge, Hellion, and Emma Frost. Subsequently, she started to bond with her friends, using her enhanced hearing to find out what happened to Icarus for them, learning that Stryker killed him. After Surge received a distress call from Forge, X-23 followed the team along to Dallas to rescue him from the sentinel Nimrod. At the height of the desperate battle she managed to cut through to the interior of the machine with her claws, allowing the sentinel to be defeated. She was mortally wounded during the battle however, and unable to heal herself. In order to save X-23, Julian Keller (Hellion) convinced Emma Frost to unlock his telekinetic Powers in order to rush her back to the mansion where she was healed by Elixir. As Julian recovered his strength, and found that his power levels were massively enhanced, Laura kept watch over him. Emma confronted Laura, asking her to leave the school because of the trigger scent. Their confrontation is cut short by Cessily coming to Laura's defense. Cessily pursues Laura, the two go for coffee and discuss Laura's crush on Julian. However, the cafe is attacked by Kimura and her minions. It is revealed that the attackers have not come to reclaim Laura, but rather to capture Cessily. X-23 #1 LIMITED EDITION VARIANT COVER - SIGNED BY BILLY TAN! Laura goes back to the Xavier Institute; Hellion interrupts her as she is gearing up to attack against the facility. He informs her that he is coming with her. The two find a facility hide out; Laura interrogates a man at gun point. Upon securing the information she needs, X-23 shoots him in the head. Julian is shocked and tells her that killing will no longer be a part of their interrogation technique. X-23 looks at him, silently. Renouncing killing, but not other brutal methods, they manage to advance to the base, extorting information from the Owl, who refers to X-23 as the Kingpin's former top assassin - a position previously held by other dangerous villains such as Elektra Nachios and Bullseye. Laura and Julian infiltrate the Facility and are intercepted by Kimura, who disables them using ultra-sonics, attacking X-23 provokes Julian to unleash an attack pinning her against the wall. X-23 begs Julian to create a telekinetic bubble inside Kimuras brain or heart, as this is the only way to kill her indestructible body. Julian once again refuses to kill, showing his true X-Men morals, and instead blasts her through the facility roof, and hurling her 27.3 miles away. The two soon find Cessily in liquid form barely able to compose herself. The group are attacked by Predator X, who has absorbed Cessily's liquid mercury skin, X-23 and Hellion hold their ground, but are outnumbered. They decide to fall back, and are quickly pursued by the Predators. X-23 holds her attackers back, noticing Julian has taken a serious blow defending Cessily. Cessily confronts one of the wounded predators, returning the mercury to her body, strengthening her. The group is once again ambushed, only this time to be rescued by the X-Men and New X-Men. (Cyclops, Emma Frost, Colossus, Shadowcat, Surge, Dust, Elixir, and Rockslide) The group turns the tables on the attackers, and defeat the remaining facility troops, during the shuffle, the remaining Predator escapes. After the battle X-23 and Emma Frost share a brief moment, apparently Emma now sees that X-23 is an invaluable member of the team, and was wrong to have doubted her. Frost then finds Kimura sometime later trying to assassinate X-23, and confronts her, calling her no more than a bully, and erases the one happy moment in Kimura's life, and psychically suggesting that Kimura's assignment now is to hunt down the remaining members of the facility and kill them. X-23 is a female clone created from Wolverine's genetic material; her mutant Powers are similar to his. Notable differences are the number of hand claws (she has two to Wolverine's three) and X-23's foot claws (which he lacks entirely). These claws were brutally extracted by Zander Rice, sharpened, coated with adamantium, and reinserted into her body. X-23 escaped before the procedure to fuse her entire skeleton with adamantium could be performed. Consequently, she possesses an increased healing factor. However, because X-23 is in her teens her factor has yet to develop to the levels Wolverine possesses. X-23: TARGET X #1 - SIGNED BY ARTIST MICHAEL CHOI! Since X-23 lacks an adamantium skeleton, there are limits to the amount of pressure her body can resist relative to Wolverine. A benefit of her healing factor is that her senses, agility, reflexes, endurance, and stamina are all developed to a level beyond the range of a normal human. 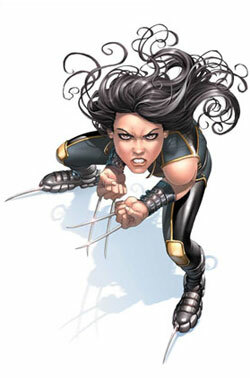 X-23 received intensive training in ranged weapons, explosives, and both armed and unarmed martial arts. Her skills are so advanced that during the New X-Men's confrontation with the advanced sentinel, Nimrod, she was the only member of the team that the sentinel assessed as a severe threat. Upon initially encountering her, X-23 might be mistaken for a typical young woman, calm and quiet, (with the DNA of Wolverine). However, as her character evolved, she has become somewhat darker and more complex. X-23 is very taciturn, rarely uttering more than five words at a time. She also engages in self-harm, cutting herself with her own claws, something she has done since a very young age. X-23 is a highly trained and skilled combatant; she is able to kill dozens of heavily armed opponents during a single encounter, and she does so with little emotion or remorse. However during her encounter with Captain Universe she became much more emotional than usual. In the Ultimate X-Men, Dr. Cornelius obtains a sample of Wolverine with the intention of creating a clone, making it a possibility that X-23 will make an appearance in the title. In the 2005 miniseries X-Men: Age of Apocalypse, a version of X-23 was revealed to exist in the Age of Apocalypse, going by the name Kirika. She was found in one of Mr. Sinister's labs after it was liberated by Magneto. At the end of the miniseries, it was revealed that she was the daughter of Weapon X (Wolverine) and Mariko Yashida. Unlike her Earth-616 counterpart, she has three claws on her hands; the metal was grafted on by Magneto. X-23 features in an arc of Robert Kirkman's Marvel Team-Up (vol. 3), featuring a group of C-list heroes dubbed "The League of Losers". A group of heroes including X-23, Darkhawk, Dagger, AraÃ±a, Gravity, Sleepwalker, Speedball and Terror (although AraÃ±a dies along the way) go to the future to prevent the villain Chronok from stealing Reed Richards' time machine, Chronok having come to the present and already having killed all of Marvel's major heroes. It's revealed Chronok is from the same time period as Kirkman's Mutant 2099; the group stays with him and his mentor Reed Richards to wait for Chronok, and during this time X-23 sparks a relationship with Gravity. They defeat Chronok, but at the end of the story, Richards reveals they can't go back to their present, due to time-travel and alternate timelines. The group decides to stay in the future, satisfied with the impact they made, however unnoticed. Mutant 2099 suggests reforming the Avengers or the "Fantastic Nine". Note that due to the Marvel Universe's method for resolving time travel paradoxes, this story occurred in an alternate universe.